Garages, both attached and detached, are usually overlooked when it comes to home maintenance. Homeowners and occupants start taking necessary steps only when their garages have already been flooded and menaced by mold. 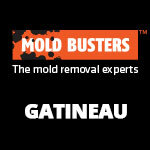 In a situation when mold is already there, there is little you can do beside calling professionals to help you deal with it. Generally, garages have wide entrances that not only allow vehicles but also water to get through during heavy precipitation, such as rain or snow. For this reason, homeowners should pay special attention to properly sealing their garages and preventing mold growth. In order to prevent water from getting in your garage and creating haven-like conditions for mold to settle in, it’s important to seal garage doors well. Very rarely does garage door weather-stripping rest tightly against the garage frame, allowing water to seep inside the garage from outside, particularly in unfriendly weather conditions. Once water is in, you have limited time to prevent problems you may experience from wet things (if you are using your garage as a storage) turning into mold habitats. 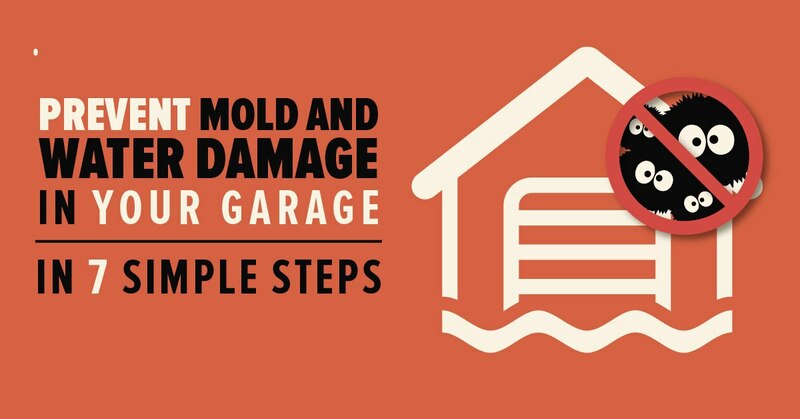 Water intrusion and mold growth not only damage the structure of the garage and home in general, but they also negatively affect the vehicles parked inside. The best thing you can do to protect yourself from these negative effects is to take preventive measures against water intrusion to prevent mold growth and any further damage. 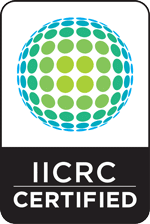 Prevention is better than remediation. In this article you can read 7 tips to help you deal with water in order to prevent mold growth inside your garage. Pay attention to your garage’s overall situation. For example roof cracks can be a cause of small puddles in your garage which, if not properly dried out, can become one of the mold causes. With that being said, check the garage roof, gutters, pipes, etc. frequently to ensure that they are in good condition (i.e. that nothing is leaking). If there are leaks, fix them immediately. There are several ways water can get in your garage – it can be due to heavy rains, snow and flooding, for example, or you can bring the moisture in with your car. This accelerates mold growth inside the garage along with structural damages to the building as a whole. Once water is in your garage, you have to make sure it will go out as quickly as possible. To achieve that, you will need a good drainage system as well as a proper floor slope. If you are using your garage as a storage, your goal is to keep stuff away from water as much as possible as a lot of things can serve as source of food for mold. Install shelves in your garage for storing things instead of keeping them on the floor. Sometimes garage flooding during heavy rainfall becomes unavoidable. 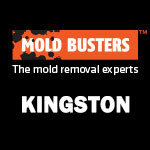 In such cases, you will avoid moldy problems with your belongings only if they stay dry. Moist, dark, confined and stuffy environments are perfect conditions for mold to develop, thus making garages perfect for mold to grow. Therefore, to prevent mold growth in a garage, it is essential to keep it well ventilated, naturally lit and dry. One of the common causes of mold (inside the garage, too) is high humidity which is often a problem due to lack of windows, air vents or any type of air ventilation. To reduce humidity inside your garage, install dehumidifiers and keep the humidity level between 30% and 50%. Opening the garage door or window for a couple of hours each day will help increase air circulation, especially during the summer months. 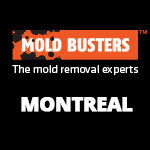 Fresh air is very important for mold prevention. If you are getting a new garage installed, you have the opportunity to ensure your garage is mold-free from the very beginning. Use mold-proof materials like metal studs instead of wood or paper. It may cost a penny or two more at the beginning, but in the long run it will definitely be worth it. For garage walls, you can always always use pre-coated aluminum or vinyl siding to ensure your walls will not soak in water, which, of course, would lead to mold growth. Cut down on shrubs or plants that have grown near your garage walls. They may look nice and green but often they can cause cracks in the walls or ceiling, which increases potential leaks and water intrusion into your garage. What’s more, plants and shrubs collect moisture that tends to accumulate near your garage walls. Place a container of silica gel, activated alumina, anhydrous calcium sulphate, or molecular sieves in the garage to reduce moisture. Extend gutter downspouts at least six to ten feet away from the garage foundation to prevent buildup of moisture around the base of the building. Never store wet clothes, jackets, shoes, wooden cases, or boxes or any other wooden objects in a garage. All of these materials could act as fuel for mold growth. These tips are simple, cost-effective and easy to follow by homeowners. 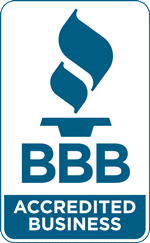 However, if you want to embrace a more efficient way of preventing mold in your garage, it’s always better to schedule a professional mold inspection from a reliable company in your area. 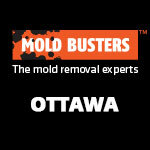 Contact Mold Busters, Ottawa’s leading environmental inspection and remediation company. We provide fast, effective and affordable mold removal and flood restoration services for garages all over Ontario and Quebec. It’s common for mold to grow in garages and basements. 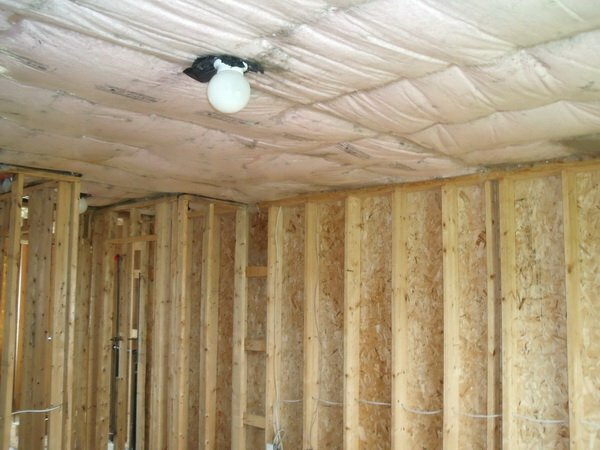 Replacing the drywall and ensuring it’s made with paperless materials is one way to prevent mold from growing.